Vampire Vixen Video Slot Guide & Review - Casino Answers! Vampire Vixen is a 5-reel, 25-line video slot developed by Vegas Technology, featuring a wild substitute symbol, scatter wins, multipliers and a free spins feature. 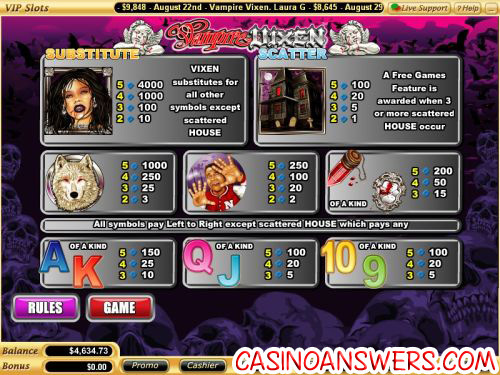 You can play the Vampire Vixen video slot game at USA-friendly casinos VIP Slots Casino and Crazy Slots Casino. Bets on the Vampire Vixen slot machine are $0.01, $0.05, $0.25, $0.50, $1, $5 and $10 per line. You can play from 1-25 paylines per spin on the Vampire Vixen slot game, giving you the ability to bet as much as $250 per spin. Vampire Vixen is a penny slot, thus you bet as little as one cent per spin ($0.01 on one line). 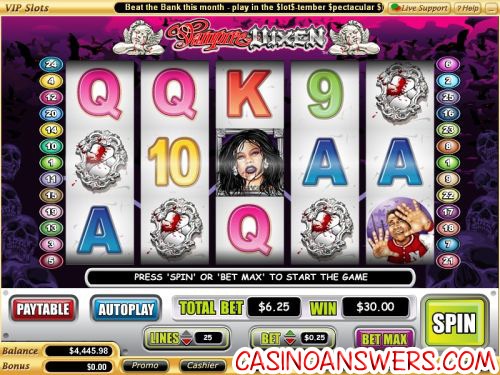 To play all 25 lines on the Vampire Vixen online slot machine, hit the “Bet Max” button or “Spin” for other wagers. The Vixen symbol is the highest paying symbol on the Vampire Vixen slot machine. If 5 Vixen symbols land on a selected payline, you will win the 4000 coin top jackpot. The Vixen symbol is wild and will substitute for all symbols on Vampire Vixen with the exception of the scatter symbol. When participating in a winning combination, the Vixen symbol will double your winnings. When the Vixen symbol is apart of a winning combination, she will move towards the screen with glowing red eyes. The Wolf symbol is another high paying symbol, paying up to 1000 coins. The House symbol is Vampire Vixen’s scatter symbol. 2, 3, 4 or 5 Scattered House symbols will pay 1X, 5X, 20X or 100X your total bet. If three or more Scattered House symbols show up anywhere on the reels, you will win 10 free spins with a 2X multiplier. The free spins feature can be re-triggered. During the free spins feature, selected symbols will be changed to the Vixen wild symbol. Free spins are played at the lines and bet of the triggering game. Free spins feature wins are added to payline and scatter wins. Try getting the free spins feature on the Vampire Vixen slot game at VIP Slots Casino! Payouts are made according to the Paytable. Payline wins are multiplied by the bet per line. Scatter wins are multiplied by the total bet. Scatter wins are added to payline wins. Only the highest win per payline will be paid out. Coinciding wins on different paylines are added. All wins occur on selected paylines except scatter wins. All symbols pay left to right, except for the Scattered House (which pays any). The wild symbol substitutes for all symbols except for the scatter symbol. The prize is doubled if one or more Vixen wild symbol appears in a winning combination. Hit “Autoplay” to open up the autoplay mode on the Vampire Vixen slot machine. In spin settings, you can set the number of spins (5, 10, 25, 50, 100, 250 or 500) and the number of seconds between spins (0.25, 0.50, 1, 1.50 or 2). Stop settings include to stop once all spins are complete, stop when a jackpot is won, stop if a win exceeds or equals ($50, $100, $150, $200 or $250), stop on any win and stop if credits increase/decrease by ($50, $100, $150, $200 or $250). You can stop autoplay at any time by using the “Cancel Autoplay” button. Although lacking a bonus game, Vampire Vixen offers two decent top payouts and a free spins feature. Its theme is probably the best part of the Vampire Vixen video slot due to the current vampire craze going on (although this is no Twilight). To play the Vampire Vixen video slot, sign up and make your deposit today at VIP Slots Casino! What is the best place to play the Vampire Vixen video slot? If you’re looking for the best online casino to play Vampire Vixen, we recommend you play it at VIP Slots Casino. For more information on VIP Slots, please read our VIP Slots Casino Review. Are players based in the USA allowed to play Vampire Vixen for real money? Yes, players who are located in the United States of America are able to play the Vampire Vixen casino game at VIP Slots Casino, Crazy Slots Casino or any one of the casinos in our list of Vegas Tech online casinos. For more on VIP Slots, please read our VIP Slots Casino Review. Where can I play a Flash game of the Vampire Vixen slot for free? You can play a Flash game of Vampire Vixen at your choice of VIP Slots Flash Casino and Crazy Slots Flash Casino. You can play for free or play for real money. If you experience problems with the Instant Play Flash casino software, try downloading the latest version of Adobe Flash Player.